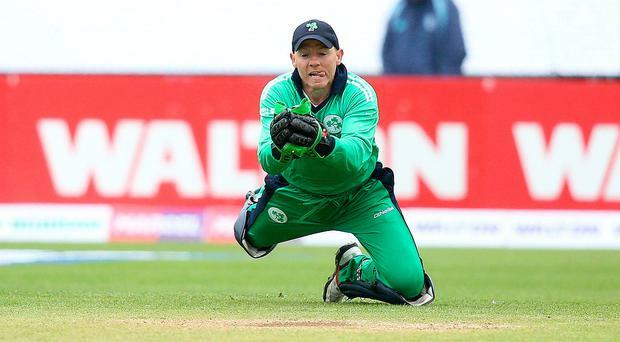 Miracles really do happen, and Ireland are one win - or a wash-out - away from appearing in their fourth successive ICC World Cup. At the start of the week, it needed three results to go Ireland's way to give them a chance of having a 'live' game today to finish the Super Six stage of the qualifying tournament. Amid incredible scenes at the Harare Sports Club yesterday, in front of a seething capacity home crowd, the hat-trick was completed when Zimbabwe fell four runs short of their target score to give the United Arab Emirates their first Super Six win and deny the hosts the second and final place at next year's World Cup finals. That will go to the winners of today's match between Ireland and Afghanistan, although if weather interferes for the third successive day, a no-result will be enough for Ireland to progress as they and the Afghans would join Zimbabwe and Scotland on five points but Ireland have the best net run rate. Ireland cannot rely on the weather forecast. Yesterday's was supposed to be worse than Wednesday but only 12 overs were lost to the rain and, set 230 to win in 40 overs, Zimbabwe were on course for victory, needing 53 from the last six overs with six wickets in hand. They had consistently scored at the required nine runs an over for the previous six overs, but UAE - bowling and fielding out of their skins, despite having nothing to play for except an honourable victory - took three wickets in the next four overs to leave Zimbabwe needing 19 off the last two. Amir Hayat had been the UAE's weak link in their bowling attack but he conceded only four runs off the penultimate over, but Craig Ervine - who has played for Northern Knights in the inter-provincial championship - sliced a four to thirdman in the last over to leave him needing to hit a six to get to the World Cup. He could manage only a two. The Ireland squad was watching helplessly but increasingly excitedly on television in their rooms back in the team hotel - a few of them turned up at the ground after their afternoon training session but the full house signs were up - and for Niall O'Brien, today's scenario could not have been scripted better - a chance to qualify for another World Cup in his 100th one-day international. "It would be fantastic to play another World Cup in England," he said. "I've lived there for 15 years, have an English wife, a lot of supporters in England through the county sceneand I remember the World Twenty20 in England in 2009, that was a great occasion and we had fantastic support. So I'll be doing everything to get us there," he said. "That was an unbelievable finish, fantastic from our point of view. That's as well as Dougie (Brown, their Scottish coach) has got them playing since he took over and perfect timing for us to put in such a performance. Two weeks ago they could have been out of the tournament!" But now it comes down to one match against their newest and fiercest rivals, who just happen to be led by ex-Ireland coach Phil Simmons, with John Mooney, one of O'Brien's long-time friends, as the Afghanistan fielding coach for this tournament. "Their presence will certainly make it interesting but both teams know each other so well. There's not much between us as results have shown in the last 18 to 24 months, we've had some good series and whoever plays best on the day will win," he said. "The boys are just grateful to get a second bite at the cherry." That's an acknowledgement that with two defeats in the tournament they are only in this position because other results have gone their way. "We have played pretty well this tournament, but haven't been 100 per cent at our best. We had two or three chances to beat West Indies, and at halfway against Zimbabwe everything we tried didn't come off, we kept hitting the ball to the fielders. "So we've probably had 35 to 40 bad overs in the tournament. Now it's a matter of putting 100 overs together." But if Ireland can rely on one man to perform when it matters, it is and has been Niall O'Brien. He added: "I've a lot of good memories, I've enjoyed all the World Cups and I enjoy playing on the big stage. Hopefully tomorrow is no different."